Let me introduce you to the metronome! It is one of the most important tools for improving your running, that you’re probably not using. The body loves rhythm, we have our heart beat, our breath rate, circadian rhythms, to name a few. Running at a consistent rhythm, will enable the body to run more easily, and more efficiently. Similar to the way that it’s used by musicians, the metronome is used to help runners maintain a consistent cadence, which is the number of footsteps that you take in one minute. The optimal cadence for most people is between 170–180 strides per minute (or 85-90 spm for each leg.) Optimal cadence is based on leg length. Taller runners should aim for an optimal cadence of 170 spm or higher, while shorter runners should aim for an optimal cadence closer to 180 spm, but not higher. Get a metronome. Use the metronome in the ChiRunning APP, or purchase one from the ChiRunning Store. Do a one minute timed run, and count your footsteps. Run at your normal training pace. Do this three times, and take the average number of steps of the three. For a couple of weeks, do part of your runs with the metronome set at the cadence that you discovered from your timed run. After you’ve gotten used to the metronome, start increasing the cadence by one beat every 1-2 weeks, until you are in the ideal range. Increasing your cadence at this rate will make it easy for the body to adapt. Remember the rule of gradual progress, and be patient with yourself. 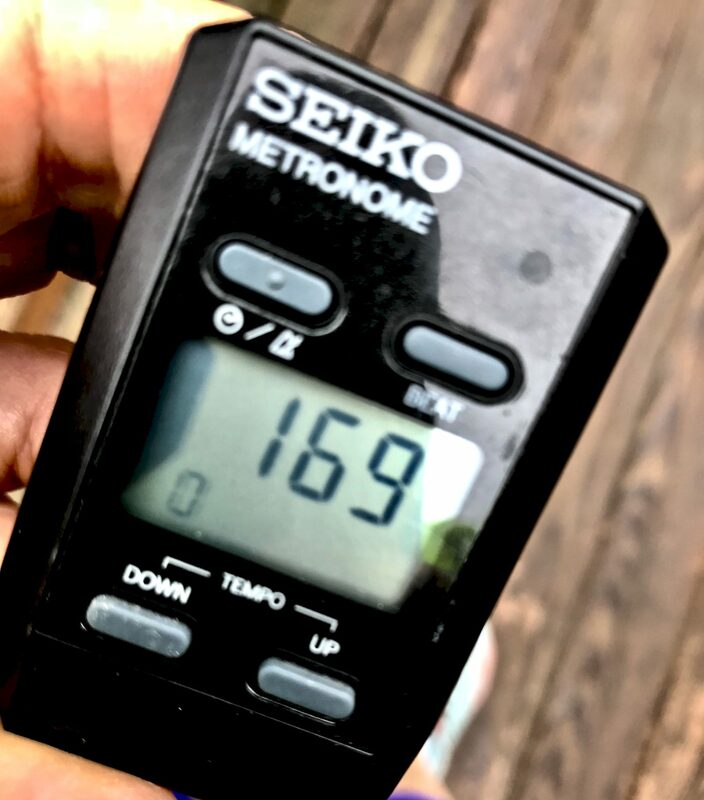 Don’t expect to go from a cadence of 160 to 175 overnight. Try to relax, and enjoy the challenge. Have fun getting your rhythm! ← ChiRunning Workshop Coming this Fall!